As the leader of an ancient civilization, explore unknown lands in order to develop your empire. Found new cities and construct buildings in order to exploit natural resources, establish trade routes. Set out to conquer barbarian villages or increase your scientific knowledge. Don't forget to maintain good standing with the Gods! 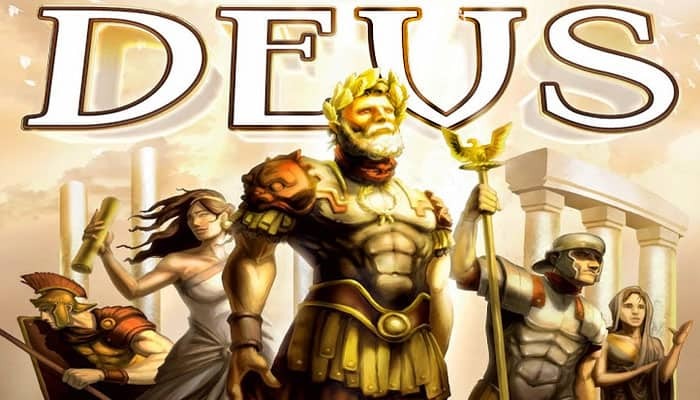 In Deus, players work to develop their own civilizations in a shared environment. Each player starts the game with five building cards, and on a turn a player either uses one of these cards to construct a building or discard one or more cards to make an offering to a god. Cards come in six colors: red for military, green for resource production, blue for trade, brown for scoring, purple for temples, and yellow for a variety of effects. When you construct a building, you build it in the appropriate location on the modular game board - which is sized based on the number of players with the hexagonal tiles composed of seven landscape "circles" - then you place the card in your personal tableau in the appropriate stack of colored cards and activate the power of all of those cards already in your tableau, starting with the card at the bottom of the stack. 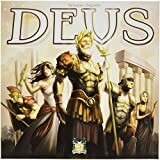 Each player begins a game of Deus with a hand of 5 Building cards. On your turn, you must choose from two actions: construct a building or make an offering to a god. Blue cards are associated with maritime buildings, which are the only wooden pieces playable on the sea regions. Trade allows you to sell resources for gold or VP. These cards also allow you to buy resources, or exchange them with the general supply. You can never play 2 maritime buildings on the same sea region. It is possible that you cannot play a blue card because you have no access to the sea. It is possible that nobody can play a blue card because all sea regions are occupied. Sold resources are returned to the general supply. The resources purchased are taken from the general supply.